Sometimes you come across a building of which you think it is just awesome. One of these buildings is Hantei Nezu, a unique three-storey wooden building, right in the Yanesen district. The restaurant was established in 1917. The building itself has been designated as an important cultural property. What is interesting about this place is that it does not serve you gourmet food in the classical sense, but it serves you a type of food that you would rather associate with an inexpensive street food. 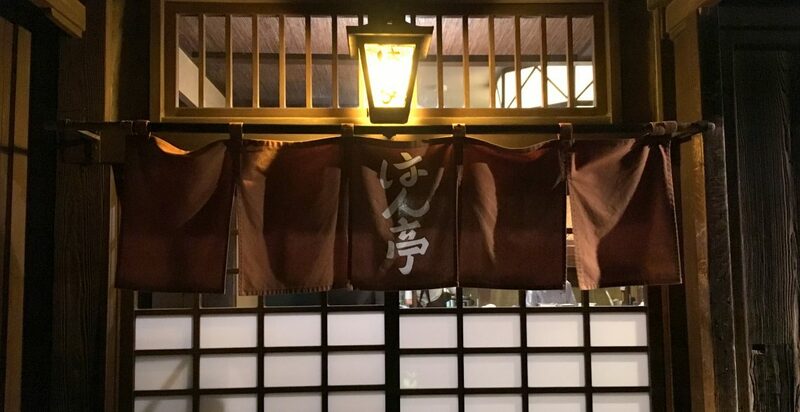 At Hantei they serve kushiage, deep-fried skewers of meat and vegetables. Kushiage is a mix of 2 greasy foods that cater to the common people, yakitori (chicken skewers) and tonkatsu (deep-fried pork cutlets). However, there is no need to look down on these foods at all. The love of the Japanese for food has lifted these simple foods to greatness. In particular at Hantei, this food is amazing. I must admit I am a fan of greasy food, I know it’s not good for me, but as a Belgian of course I love our Belgian fries, I know that frying can do amazing things with food. The skewers at Hantei are near perfection. The skewers that are being served at Hantei. the second floor has a much more “light” feeling with the tatami mats and yellowish walls. The second floor also has a small private room for 5 people in dark wood. the third floor is like the second floor with tatami mats, but smaller. If you are seated near the window, you can see the Tokyo skytree. The two small photos, top: the third floor, bottom: the hallway on the ground floor (with regular chairs). There is only one course in this restaurant, as apparently they know what and in which order you should eat it all. 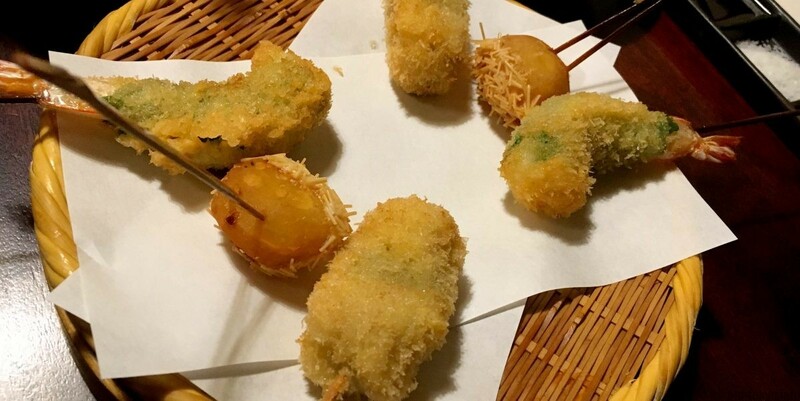 The course is called the ichinozen course, consisting of six deep-fried skewers, two appetizers and fresh vegetables (which you can bring to taste in the miso dip). What it will consist of will depend on the season. 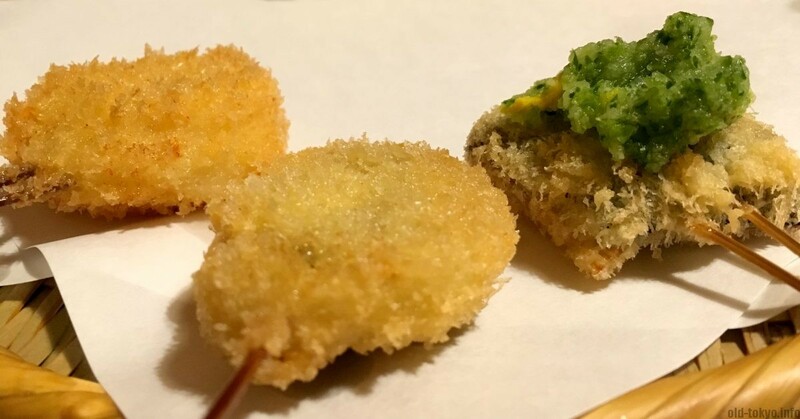 Examples are shrimp wrapped in a shiso leaf, yanaka ginger or a rectangle cut from a lotus root vegetable, leek with pork, beef with cheese, asparagus, squid and much more. After the 6 skewers are finished, they will ask you whether you would like to continue (you could in theory stop at this point, but I would not recommend that). If you continue, you will get 6 more, then you can choose again for 3 more, and then after these 3 you can choose one by one depending on your taste. The course ends with rice (plain or as ochazuke), followed by dessert. These two last items are also optional, so you could choose to just keep on indulging more skewers. Please note that if you reserve beforehand, you will be required to spend a certain budget, meaning that you will not be able to stop after just 6 skewers. The skewers are made of fine bamboo needles that are deep-fried in vegetable oil, and brought to you by the waiters as they are still hot. At your table you have a couple of condiments that go with them. They will bring them to you on a small tray with 3 choices (brown sauce, salt or a miso dip, that I found best suited for the vegetables). You can also ask for mustard or lemon if that’s your thing. 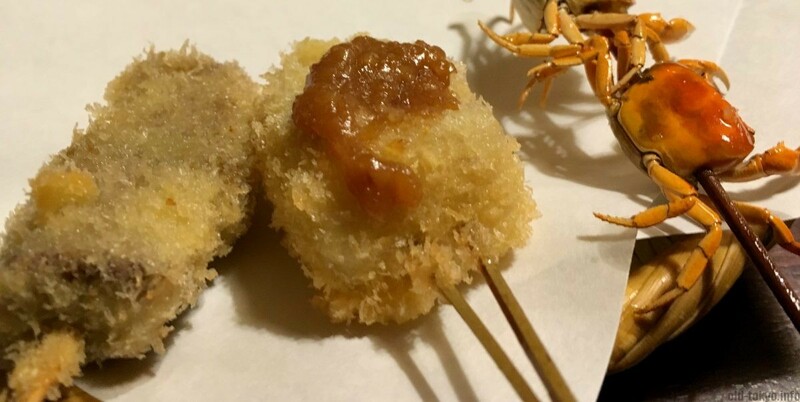 Usually in kushiyake places there is a the classic kind of pot of brown sauce in which you can dip the skewer once (it is very bad manners to do it twice, and definitely not after you already took a bite from the skewer, the customers after you will use the same sauce). But I guess due to the more upscale visitors of Hantei, they have opted to give everybody their individual sauce tray. Apart from this beautiful restaurant building in Nezu, Hantei has a branch in the Shinmaru department store (shinmaru biru) next to Tokyo Station. Nezu Station – 1 minute walk (Chiyoda line). Exit 2 is closest. Budget: If you follow the recommended basic course with 15 skewers, rice and dessert, it will cost you JPY 6588 (tax included). If you eat a bit less skewers and no dessert, you can do it within JPY 4000. A children’s menu is available for JPY 2376.